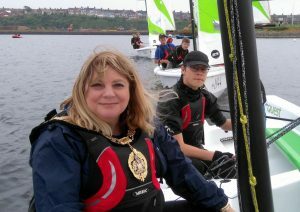 The Mayor of Barry Town, Janice Charles was at the Barry Community Water Activity Center on Tuesday evening helping the Barry Sea Cadets launch three new sailing dinghies. The RS Quest class dinghies have been given to the Barry Sea Cadets by the Marine Society as part of their campaign to get more Sea Cadets out on the water. The boats offer an exciting experience being equipped with modern gear such as spinnakers and slab reefing on a durable plastic hull. 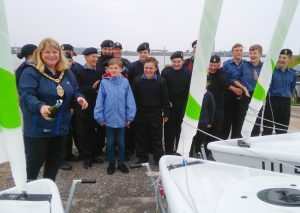 After the traditional christening of the boats with champagne the Mayor was taken out onto the water by Able Cadet Jake Richardson, and even took the helm and steered the boat around the dock, in the company of other cadets. At “Stand Easy” the Mayor had a chance to chat to the cadets and members of the Management committee who explained the opportunities for training afloat offered by the Sea Cadets. A number of the cadets having recently returned from a windsurfing and sailing course at Weymouth. If you are interested in joining the Sea Cadets they can be contacted by e-mailing barryseacadets@gmail.com. Alternatively, if you would like to learn about what activities happen on The Mole come along to the Barry Community Water Activities Center Open Day on Sunday June 17th between 1 and 5pm.